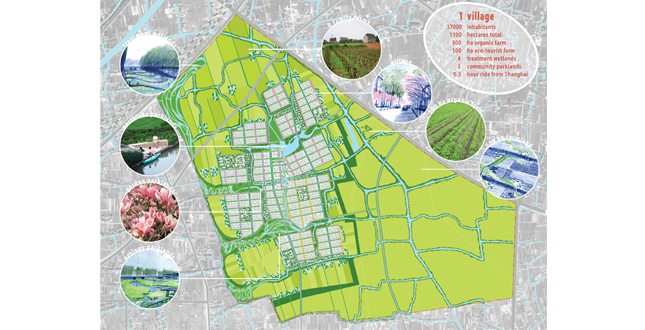 The Nanhu site is currently a tapestry of small farms and canals on the edge of Jiaxing, a city of three million. Jiaxing is uniquely positioned between Shanghai, Hangzhou, and Suzhou, and is connected to Shanghai and Hangzhou by a 20 minute ride on the high speed rail. A snapshot of development challenges in China. 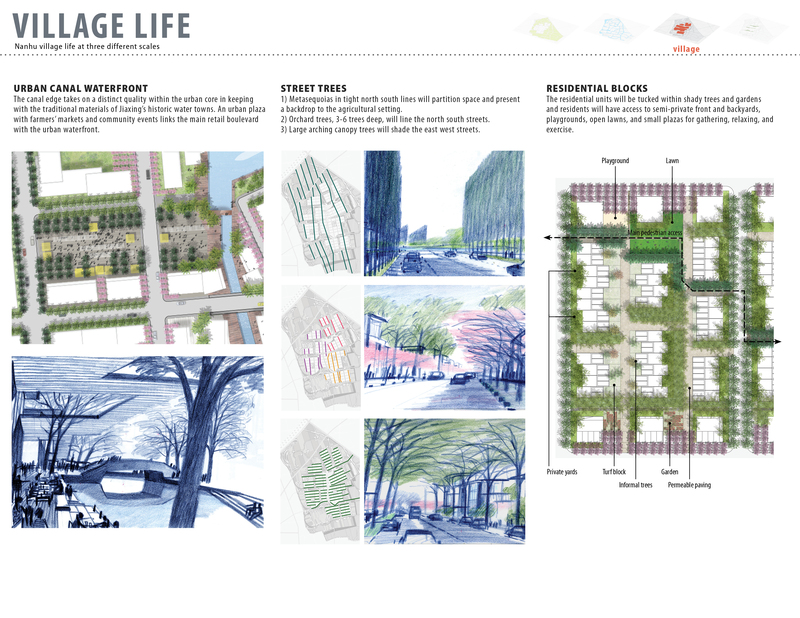 The landscape framework builds on the strengths of the site and the needs of the region to create a highly productive and desirable place to live and work. 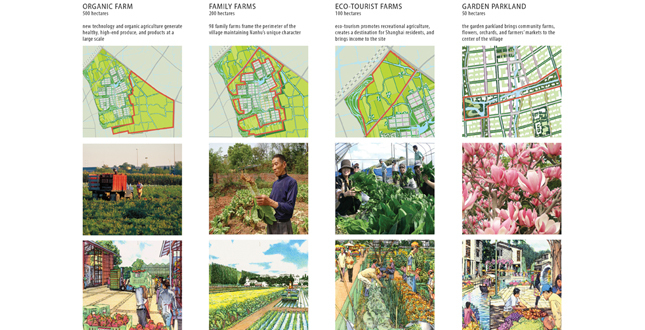 The agricultural plan integrates production, housing, tourism, and ecology to create a variety of agricultural scales and typologies. The existing canal network includes many disconnected waterways. Dead-end canals will be removed, and the system will be reconnected to allow for better flow and circulation. 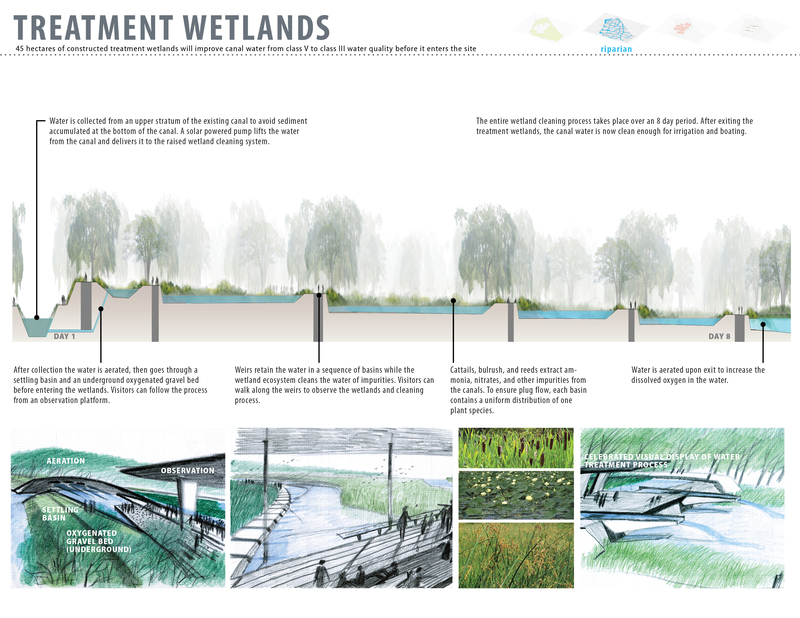 Besides performing an important ecological function, the treatment wetlands will also be educational and recreational. 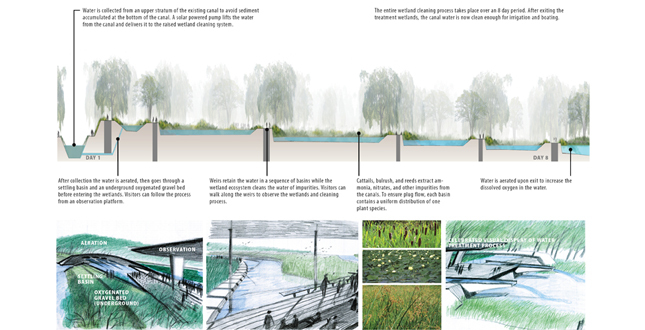 Along the weirs there will be walkways inviting people to meander through the wetland area and giving a chance to observe the cleansing and filtration process. Stormwater run-off will be collected, stored, and cleansed through bioswales. The run-off collection and bioswales will be showcased and made evident so that people can experience the water cleansing treatment process. The run-off will be treated through a series of terraced filtration swales before entering the canals in a highly visible manner. 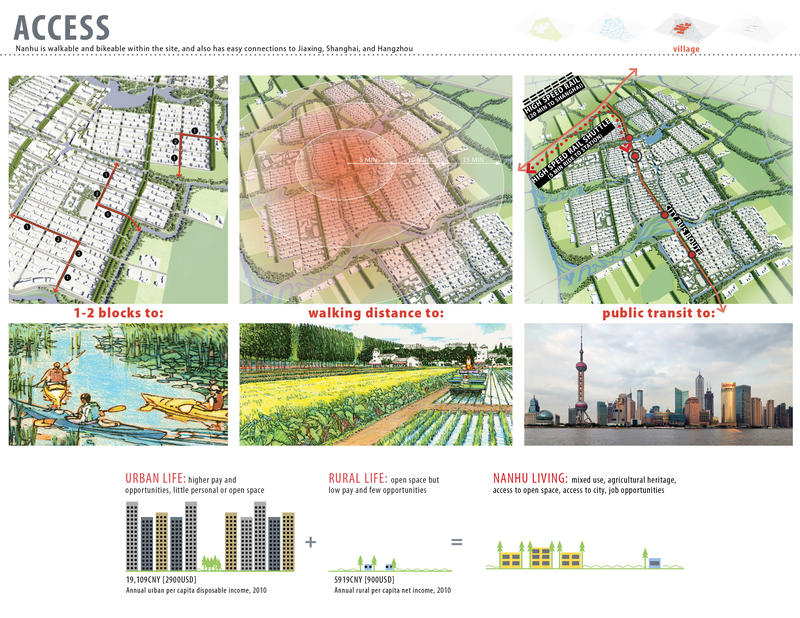 Nanhu is walkable and bikeable within the site, and also has easy connections to Jiaxing, Shanghai, and Hangzhou. 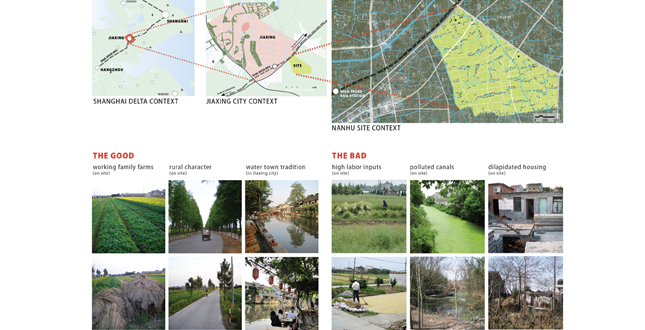 A snapshot of Nanhu village life at three different scales. 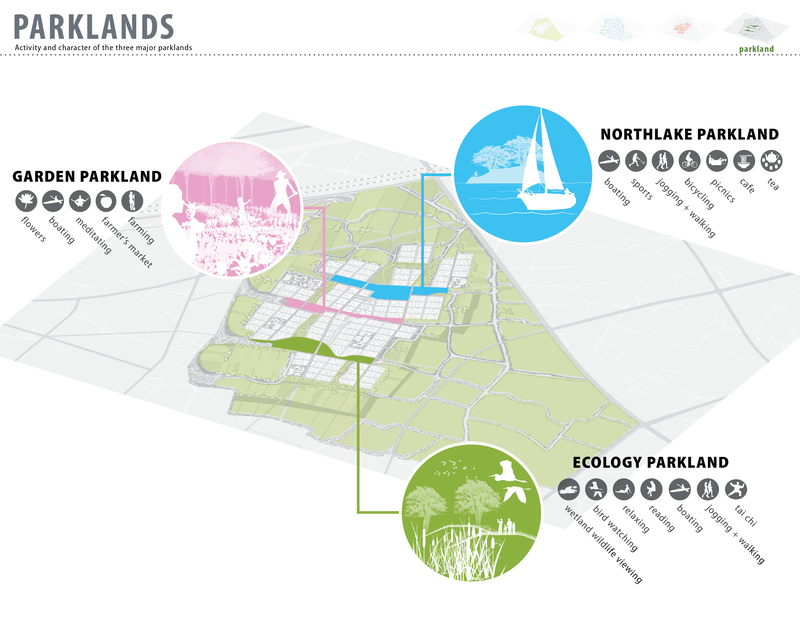 Three major parklands run east west within the development, each with distinct character. 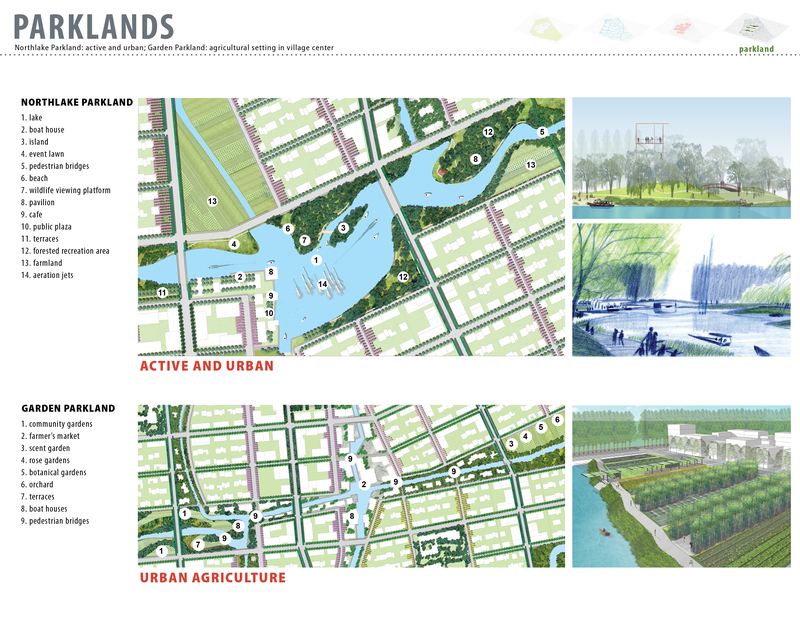 These parklands are intended to have a regional draw, and provide amenities for the surrounding neighborhoods and the greater Nanhu district. 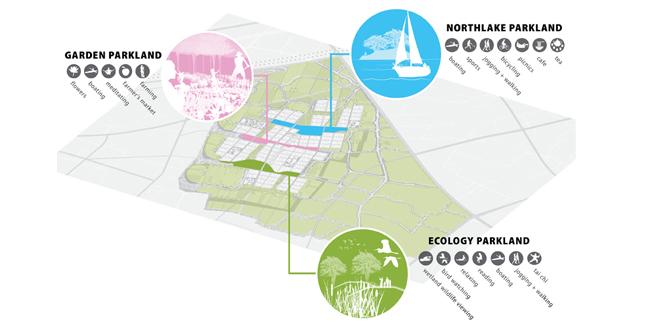 The northlake parkland is the most urban and active of the three parklands. The garden parkland brings a sense of the agricultural surroundings to the village core, and offers a respite from the dense urban surroundings in a garden setting. 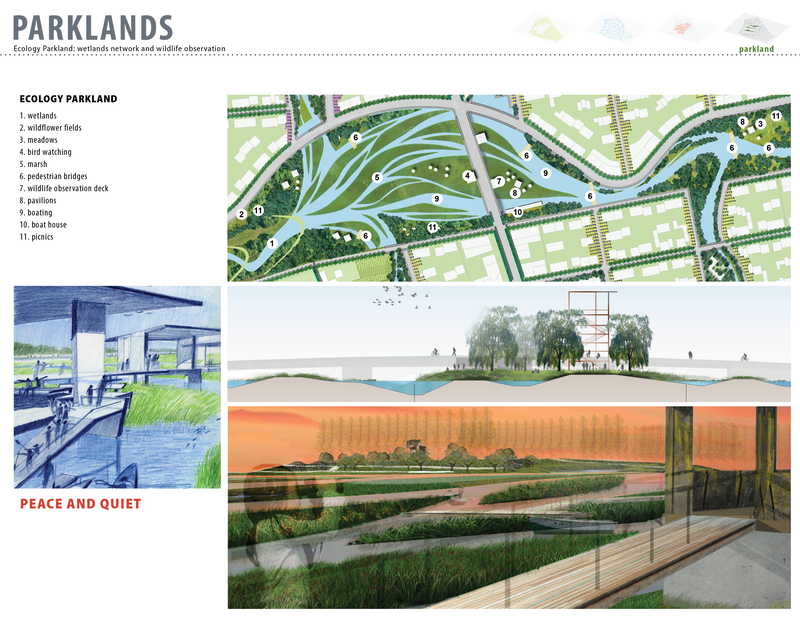 The ecology parkland is an extension of the treatment wetlands and features meadows, wildflower fields, and marshes. Wildlife viewing terraces, bird observatories, and shelter pavilions are placed within this ecological park. 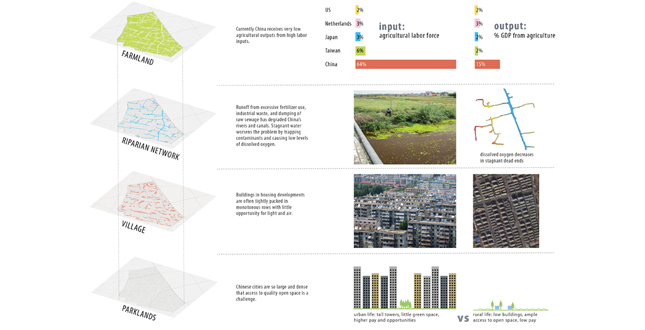 Sprawling megacities around the world are overtaking arable land to accommodate increased spatial demands. 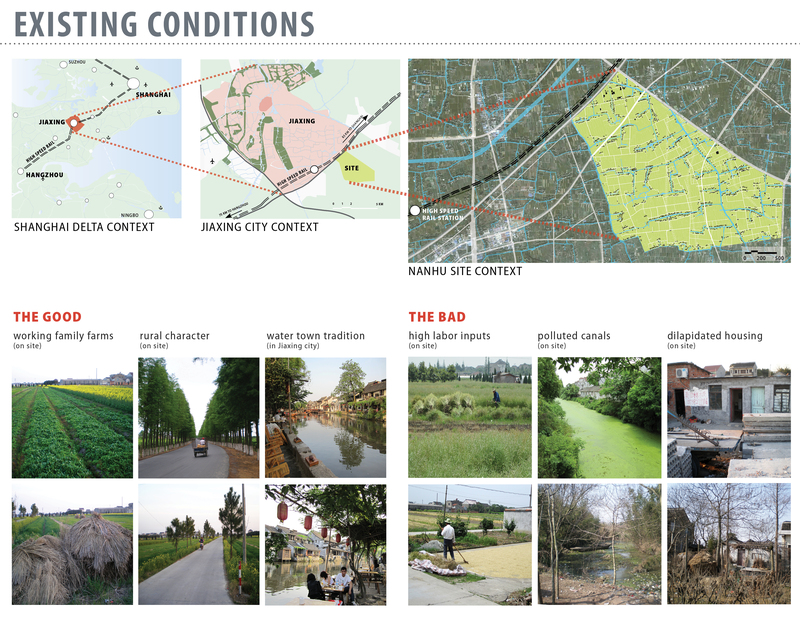 The larger these cities become, the further agricultural landscapes are forced away from the people they sustain. 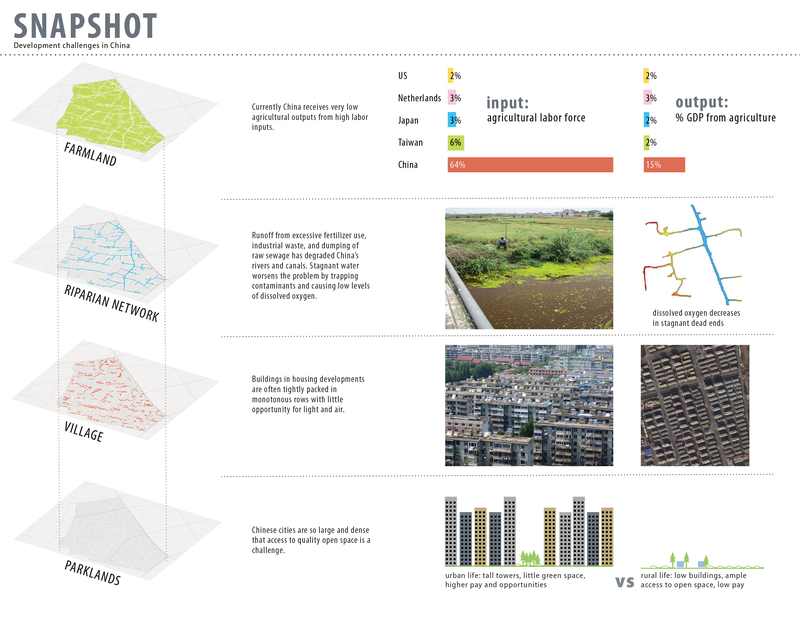 This project brings innovative hybrid agricultural and urban typologies into close dialogue at the crux of two major metropolitan cities. 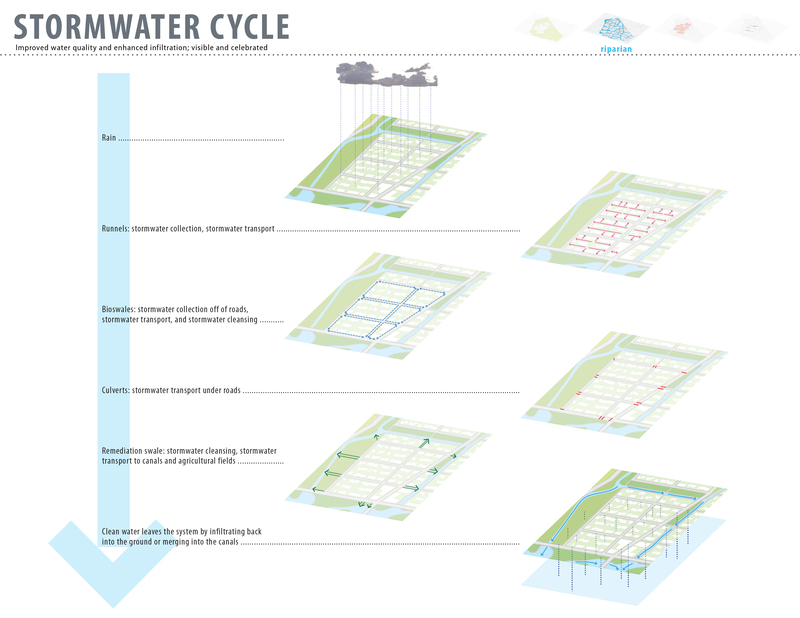 An infrastructural overhaul will treat heavily polluted water as it flows through the site, and will establish a new paradigm for modern agricultural living. Agricultural land in China is often wiped clean of all previous historic or cultural significance to make way for urbanization. As the nation struggles to house the influx of urban migration, agrarian life is marginalized. However, current trends indicate that people are craving a reprieve: the health effects of industrial pollution are being felt, wealthy populations are spending money on organic food, and the intensity of massive dense cities can be crushing and overwhelming. 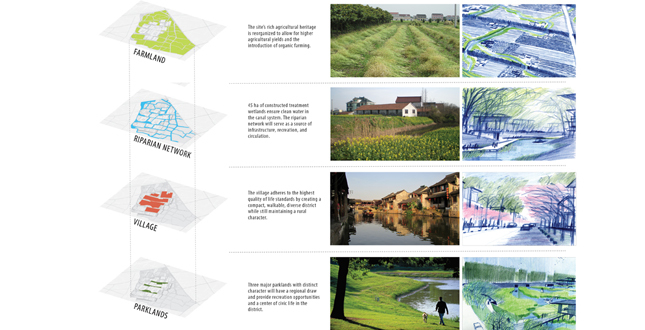 Nanhu presents a cultural shift at the intersection of urban and agricultural life in China through the creation of a dense urban village and the retention and enhancement of existing farmland. Nanhu is currently a tapestry of small farms and canals on the edge of Jiaxing, a city of three million people in the Yangtze Delta. Jiaxing is located between Shanghai, Hangzhou, and Suzhou, a region with a population near 80 million. A new high-speed rail line enables travel from Jiaxing to Shanghai and Hangzhou in twenty minutes and positions Nanhu to be both a bedroom community and destination for metropolitan residents seeking a break from intense urbanity. 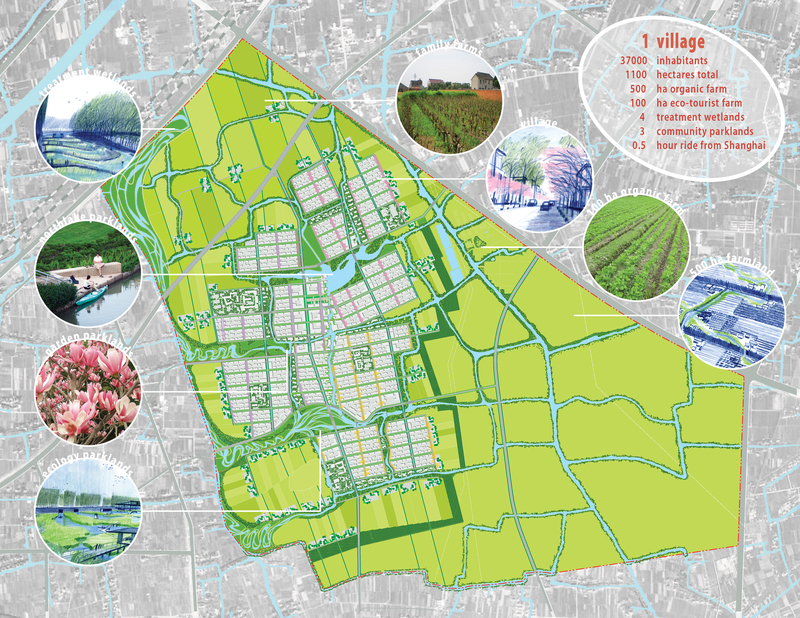 An extensive canal network, abundance of water, flat land, and fertile soil give Nanhu potential to be a model agricultural center of food production for the surrounding mega cities. However, the site faces three major hurdles: under-utilized efficiency in agricultural land organization, a stagnant and polluted canal system, and a rural population density which is too low to be sustainable in this location in China. 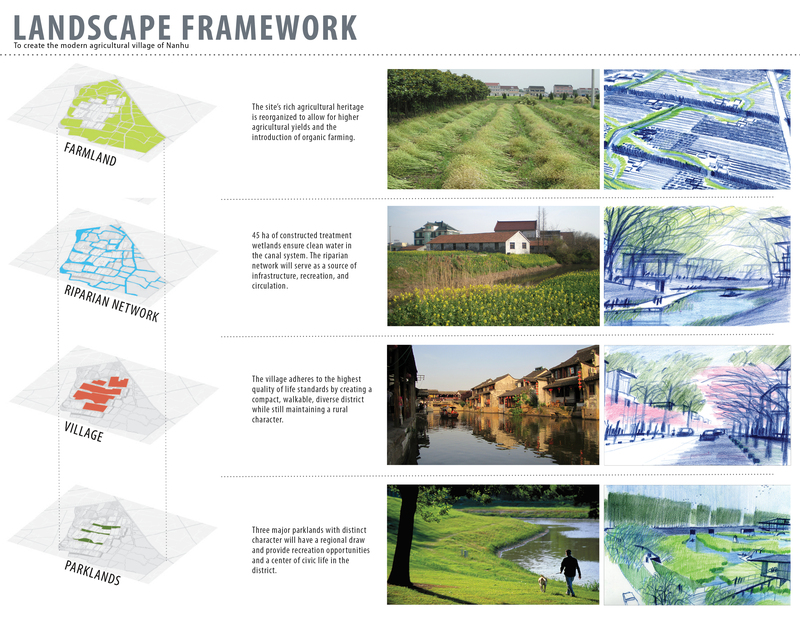 The design challenges the notion of typical rural-to-urban land transformation to instead create a model for integrated new city development. 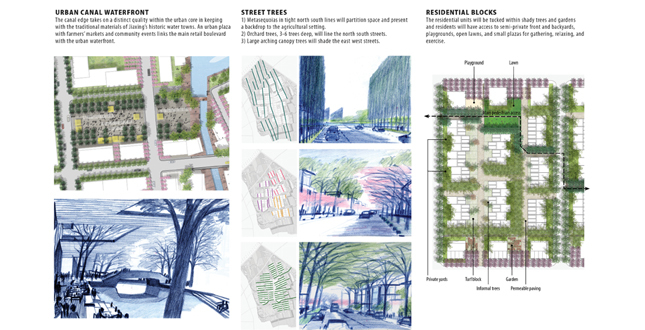 The design takes advantage of the site’s agrarian economy, proximity to transit, and urban amenities to create a village that is compact, walkable, and tightly-knit, yet has easy access to open space and maintains an agricultural character. China’s farming practices are presently very inefficient in comparison to other countries with modern agricultural techniques and technology; China receives low agricultural outputs from high labor inputs. This inefficiency contributes to low pay for farmers and a way of life that cannot compete with the allure of urban areas. 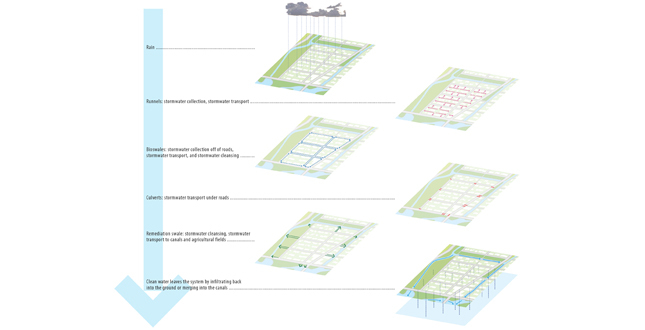 This design effectively increases farmland productivity by introducing economies of scale, increasing product values, and promoting a variety of development densities. The organic farm will be both a new productive agricultural job base and a source of healthy and sustainable foods. 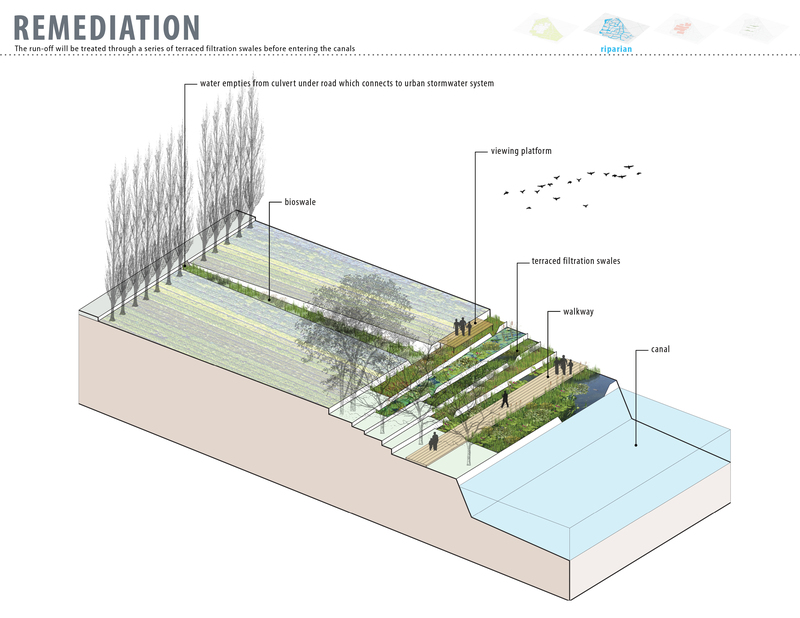 Visitors will be able to observe and appreciate food cultivation and the agricultural process. New farming products will include specialty items such as herbal medicines, fragrances, and flowers, which are products with higher monetary returns that will raise the economic profile of the modern farmer. 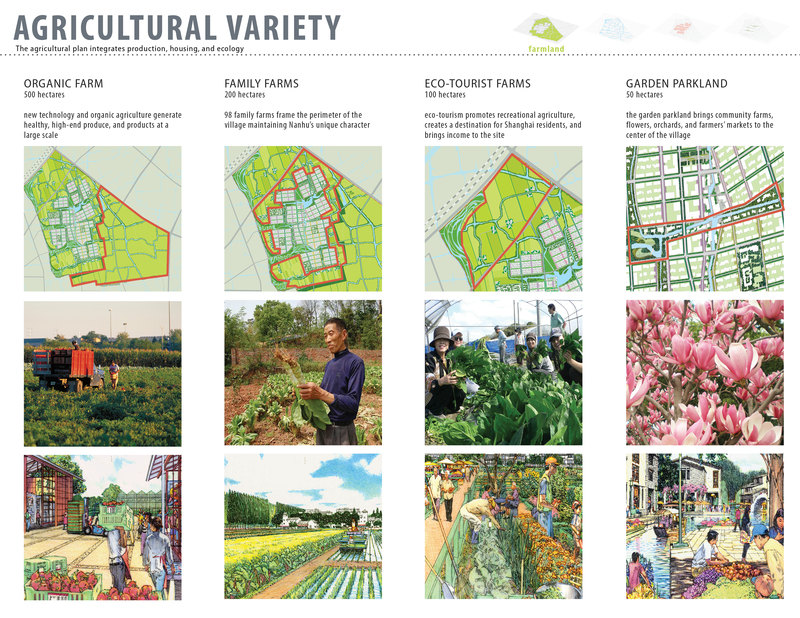 Agricultural endeavors range from large-scale organic specialty food production to farms that cater to tourism, family farms, and community garden plots for all to access. This diversity will attract different people and interests while forming a precedent of agricultural innovation in the region. 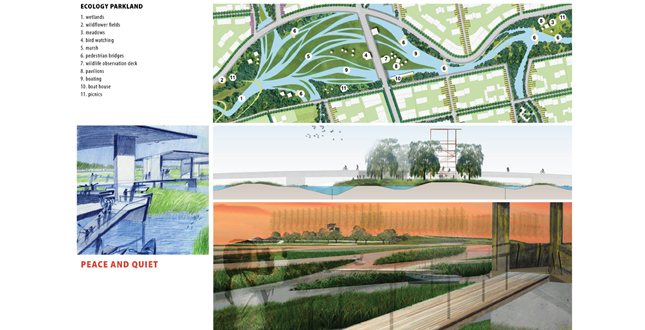 The success of the project depends heavily on addressing existing degraded environmental conditions by introducing treatment wetlands and reorganizing a historic canal network that will allow residents and visitors to directly engage with the water. 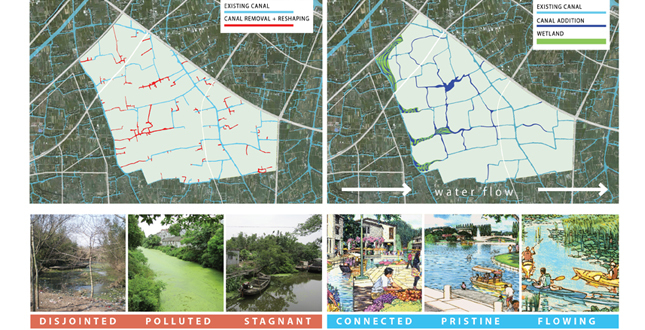 As it exists now, the on-site canal network includes many dead-end segments and disconnected waterways, causing water to stagnate and depreciate in quality. 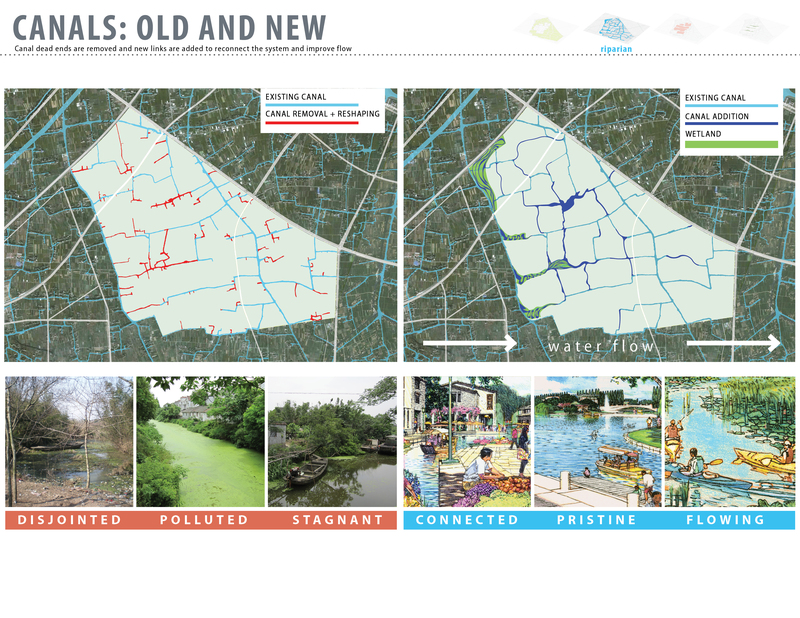 Moving ahead, dead-end canals will be removed, and the system will be reconnected to allow for better flow and circulation. Water will be collected from an upper stratum of the existing canal along the western edge of the site to avoid accumulated sediment, before entering the treatment wetlands. The entire wetland cleaning process will take place over an eight day period. After exiting the treatment wetlands, the canal water will be high quality — suitable for agricultural irrigation and boating. The canals will be integral to the village’s ecological storm drainage and water treatment. Stormwater run-off will be intercepted and treated by biofiltration landscape infrastructure before entering the canals. 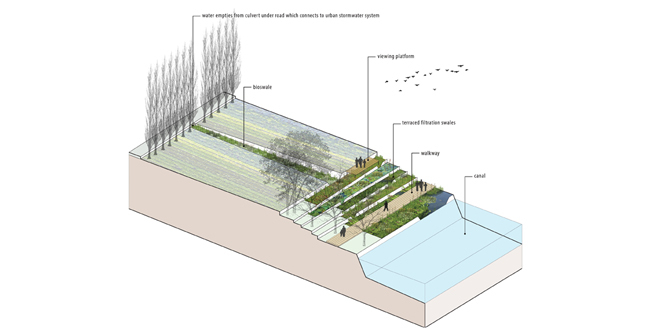 Rainwater from rooftops will be collected for landscape irrigation within the blocks. Greywater from sinks, showers, and washing machines will be reused as a supply for toilets and non-agricultural irrigation. Once reconnected, the canals will be used for water transport by boat and the edges and banks of the canals will have pedestrian pathways that will serve as a circulation network. By cleaning the water, the entire site will be poised to meet international organic certification standards and in turn increase the financial and ecological value of the land. 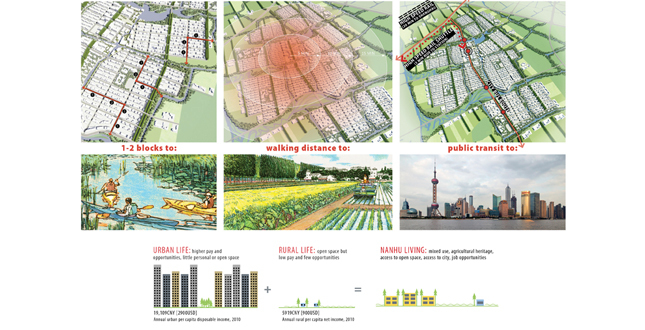 Nanhu will be a hybrid development combining China’s agricultural heritage with its present urban lifestyle. 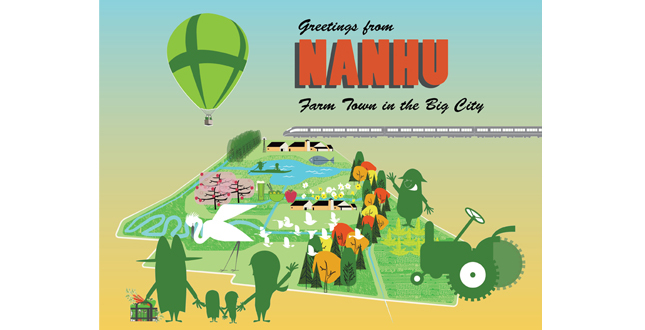 With an intended population of 37,000, Nanhu can house its agricultural workforce and serve as a bedroom community for commuters to Shanghai, be a modern agricultural weekend retreat from city life, and be an all-encompassing village with urban amenities within an agricultural framework. Large parklands span a range of uses, from boating and strolling pavilions to viewing of fabricated and restored wildlife habitat. 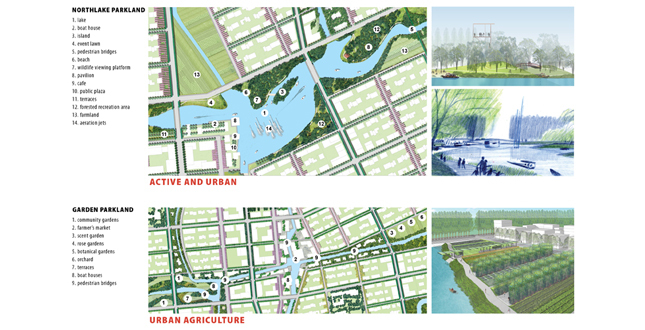 There will also be neighborhood parks, corridors along the canal network, and intimate gathering spaces within individual residential blocks. Smaller open spaces will serve the immediate neighborhood and provide amenities such as play fields, small plazas for gathering or exercise, and places for rest and relaxation in an outdoor setting. 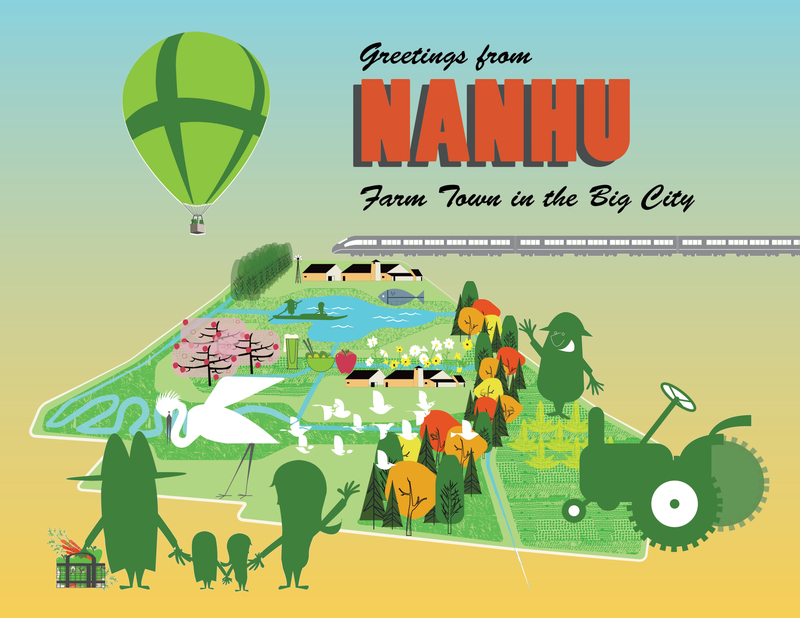 Through agricultural tourism and the ecological improvements explored on the site, Nanhu will become an educational attraction for the greater Shanghai region. 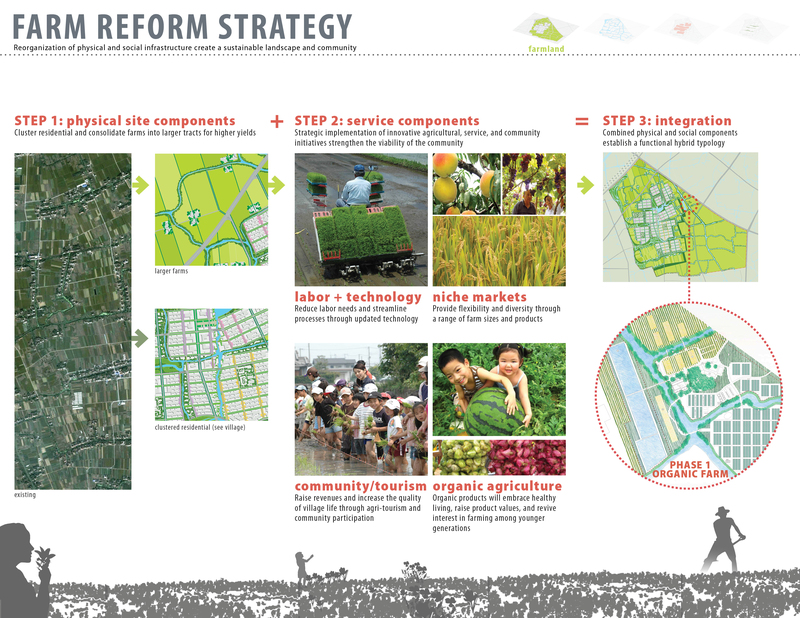 China needs a model to inform the process of land conversion with a sustainable and meaningful approach. 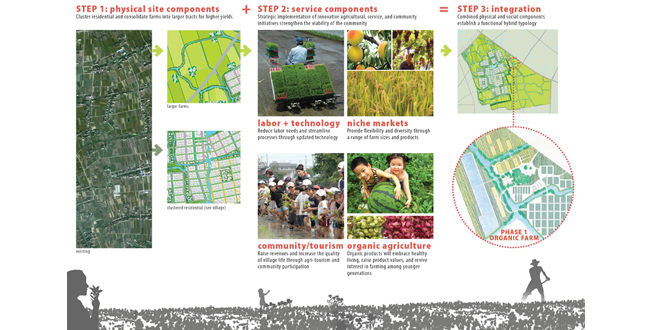 Nanhu answers this pressing question by illustrating how to integrate a compact urban village with productive agricultural landscapes. The new relationship is an example of how urbanization can increase the productivity of the land and improve environmental quality through technology and education while embracing the agrarian qualities to create an authentic place that retains residents and attracts tourists alike.